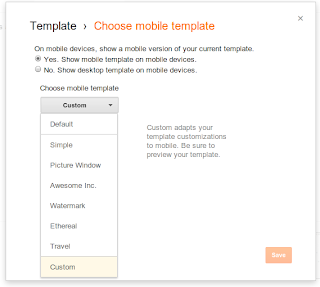 If you have a custom template for your blog and want it to appear on mobile browsers as well, visit the “Template” tab of your dashboard, click on the gear icon beneath the mobile template preview. 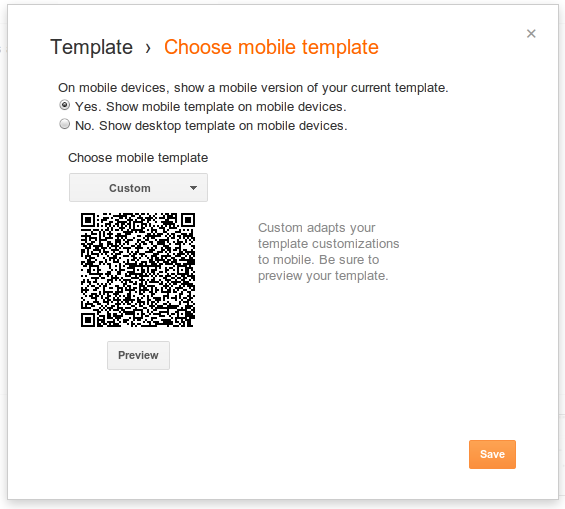 Then select “Custom” from the “Choose mobile template” pulldown. Your template may not look exactly the same on a mobile browser, so click “Preview” to make sure it appears the way you want it to before you save it. If you have gadgets on your blog, you can also control which of them will be available in mobile view, using this new attribute: mobile in <b:widget> tag. It can be 'default', 'yes', 'no', or 'only'. The following widget will not be available in mobile view, because it’s a BlogArchive widget. To make it available in mobile view, add mobile=’yes’ attribute to it. Setting mobile to 'no' makes a widget not display in mobile view, even if available in mobile view by default. You can also make a widget available only in mobile view by setting it to 'only'. 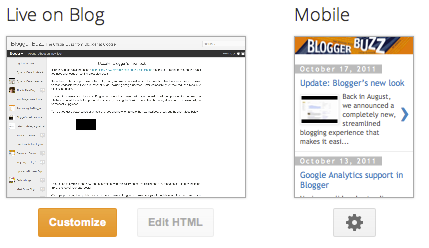 The content of a widget can modified for mobile view with the boolean variable data:blog.isMobile. 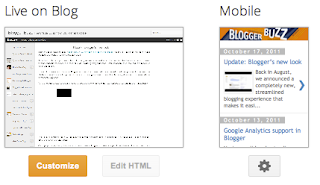 The above template HTML shows different contents between desktop view and mobile view, depending on the value of the data:blog.isMobile variable. You can conditionally give different CSS properties to a same class between desktop view and mobile view, as the <body> tag of Blogger mobile templates has mobile as its class. 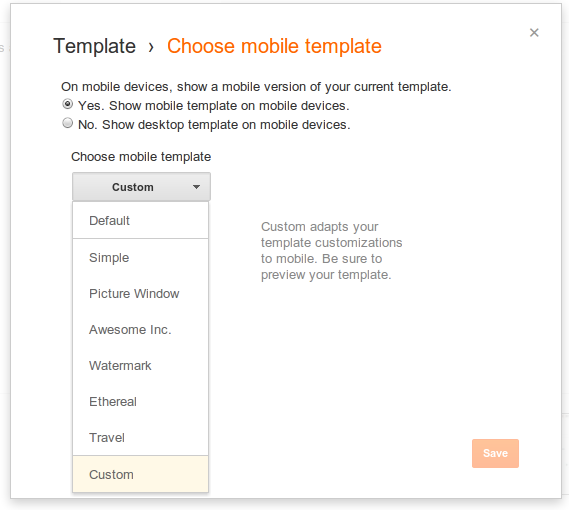 First, make sure the <body> tag of your custom template is same as the following one. Then, you can define different CSS properties for desktop and mobile view. We hope you will enjoy making your very own mobile templates. Many Bloggers put a lot of time and effort into creating a unique look for their blog, so today we’re excited to announce that custom templates are now also viewable from mobile devices. coverage. We have added the following includable section. For more details on the benefits you get from using Google Analytics, see this post on Blogger Buzz. If you have any questions about this new functionality, please join in the discussion on the Blogger Developer Group. Today we have made a change to the Layouts Template language to improve Google Analytics coverage. We have added the following includable section. , Dynamic Views is a unique browsing experience that makes it easier and faster for readers to explore blogs in interactive ways. We’re using the Classic view, but you can also preview this blog in any of the other six new views by using the view selection bar at the top left of the screen. We’re eager to hear what you think about the new Dynamic Views. You can submit feedback using the “Send feedback” link on the bottom right of this page. If you like what you see here, and we hope you do, we encourage you to try out the new look(s) on your own blog—read the Blogger Buzz post for more info. As you may have noticed, the Blogger Development Network Blog looks a lot different today. That’s because we—along with a few other Google blogs—are trying out a new set of Blogger templates called Dynamic Views. Launched today, Dynamic Views is a unique browsing experience that makes it easier and faster for readers to explore blogs in interactive ways. We’re using the Classic view, but you can also preview this blog in any of the other six new views by using the view selection bar at the top left of the screen. We’re eager to hear what you think about the new Dynamic Views. You can submit feedback using the “Send feedback” link on the bottom right of this page. If you like what you see here, and we hope you do, we encourage you to try out the new look(s) on your own blog—read the Blogger Buzz post for more info.
. The focus of this release is to make it easier to build applications that interoperate with Blogger by using a lightweight JSON syntax. To start using the Blogger JSON API, sign in to the Google API Console and request Blogger API access. This will take you to a form that asks you to explain how you intend to use the API, and an estimate of your daily traffic levels. This information helps us evaluate your request for approval and give us a better understanding of how the community is using our APIs as we work to improve them. // link to the post author. // And finally, append the generated content to the page body. It is important to understand that this release is the first step on a journey of discovery, as we work with all of you to build a better API for using Blogger. Please review the documentation, and join in the discussion on Blogger Developer Group and let us know what we can add to the API to make it more useful for you! Today we’re announcing the public availability of the Blogger JSON API we spoke about at this year’s Google I/O. The focus of this release is to make it easier to build applications that interoperate with Blogger by using a lightweight JSON syntax. command line tool that authenticates you using OAuth. First up you need to install Mercurial and Maven. Mercurial is the source revision control software used by the OACurl project. Maven is a java build system used to download and include the dependencies required by OACurl. Once we begin using oacurl we will use HTML Tidy to make the returned XML readable. Now that you have installed Maven and Mercurial, you can checkout oacurl and build it as follows. Once you have done this you will have a shell script in your current directory called oacurl that you can use to invoke oacurl with all the appropriate Java class paths set for you. Logging into Blogger using OAuth involves doing a round trip to Google’s servers to grant access for third parties. In the case of oacurl, this involves invoking a web browser that shows you that oacurl is requesting access to your Blogger account. Once you have granted access, then you will be able to explore Blogger’s API using oacurl. A good place to start is to list out your blogs. This is an Atom feed where each item in the list is a blog owned by the user who requested it. To see the blogs of a specific user you can change the default for a specific user’s profile id instead. For instance, here is a list of my blogs. I will leave that off the following commands for readability. To retrieve the content of a blogger blog, we select the blog we want from the list of blogs in the blog feed, and then follow the appropriate link. In this case we are using the post link as it stays within the scope of our OAuth authorisation. This, of course, won’t work for you, as my test blog is only set up for me to post to. Modify the post URL in the command to match the one from one of the Blogger blogs you own. The result from the command is the fully expanded Atom entry for the post that was just created. We can now modify the title and content using a text editor, and then PUT it back, in proper REST style. The Atom representation also contains the information required to create, retrieve, and delete the comments on this entry. See if you can spot the appropriate URLs in the output XML. You can use various libraries with the Blogger GData APIs, for example the Java GData client, but it is very useful to understand what the library is doing for you under the covers. And exploring is fun! If you have any questions after reading this post, please feel free to post your questions to the Blogger Dev Google Group. Blogger’s GData API is now available over HTTPS using OAuth 2. These changes result in less code, increased productivity, and enhanced security. Let’s take a look at how it works using OACurl, a wrapper for the curl command line tool that authenticates you using OAuth.